Three-phase computed tomography protocols are the state-of-the-art for imaging the kidneys and provide all the necessary information for surgical planning for laparoscopic surgery (Fig. 1) (3-5). These scans should be performed on a multidetector helical scanner, which allows efficient use of intravenous contrast and facilitates creating thin-slice datasets for smooth two-dimensional and three-dimensional reformations. The first scan phase is a noncontrast computed tomography scanning of the abdomen, including the adrenal glands and both kidneys. This is essential not only to plan the contrast study, but because it provides baseline attenuation value for all renal masses and detects calcifications in the urinary tract and renal lesions. The second scan phase is a vascular phase computed tomography scan (22). The timing for this phase is determined either by scanning after a test bolus of 20 mL of contrast injected at 3 or 4mL/sec or by using an automated bolus-tracking technique set to trigger from a threshold value set from enhancement in the upper abdominal aorta. Because extra time is needed to ensure enhancement of the renal computed tomography is considered the gold standard for detection, diagnosis, and staging of renal cell carcinoma. 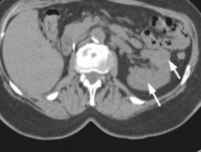 Magnetic resonance is often reserved for problem solving, or for those patients with renal insufficiency or a history of severe allergy to iodinated contrast. Three-phase computed tomography protocols are the state-of-the-art for imaging the kidneys and provide all the necessary information for surgical planning for laparoscopic surgery. FIGURE 1 ■ Three-phase helical computed tomography of the kidneys. 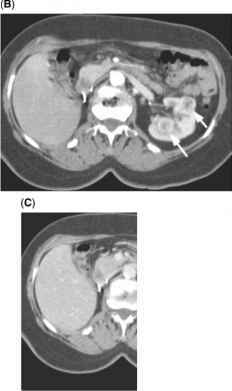 (A) Noncontrast, (B) vascular phase, and (C) parenchymal phase axial images show two renal masses (arrows) in a 64-year-old male with a solitary left kidney. Note that the intrarenal mass is barely visible in (A), and best seen in (C). The parenchymal phase (C) is the most sensitive for lesion detection. In addition to the 3 mm slices for diagnostic interpretation, a separate set of 1 mm thick slices with 20% overlap (reconstruction interval of 0.8 mm) are created and used for multiplanar reformations and three-dimensional real-time volume rendering reconstructions. Thin-section (3-5 mm thickness) coronal oblique thin-slab maximum intensity projections through the aorta and kidneys are helpful for delineating the renal vasculature. veins, an additional five seconds is added. Most scan delays are between 25 and 35 seconds in otherwise healthy patients. The third scan phase is obtained during the parenchymal or nephrographic phase of enhancement, after a delay of 120 to 150 seconds from the initiation of the bolus contrast injection (the longer delay times are used for older patients or patients with cardiac dysfunction). The parenchymal phase scan is the most sensitive and specific for lesion detection and characterization, but the vascular phase scan is also useful when characterizing masses (7,9-11,15,16,22). For each scan phase, thin sections (typically 3 mm) are reconstructed without image overlap for diagnostic interpretation and filming. Softcopy (electronic) reading is recommended using a picture archiving and communication system workstation. The thin slices with image overlap improve the smoothness of reformations and three-dimensional rendering. The computed tomography data is depicted in an imaging plane other than the axial by a process called "multiplanar reformation." multiplanar reformations that are true sagittal and coronal oblique images oriented parallel to the long axis of the kidney are helpful for localization of the tumor within the kidney and are sent to the referring urologist with the diagnostic images. Summing up the highest attenuation pixels within a volume creates a maximum intensity projection. These thin-slab maximum intensity projection images improve visualization of the renal vasculature and facilitate measurements of the distance to first renal arterial branches and distances between renal arterial ostia in those patients with multiple renal arteries. These multiplanar reformations and maximum intensity projection reformations are performed at the scanner console by the technologists using the thin-section (1 mm) dataset and sent for image review along with the diagnostic axial images (Figs. 2 and 3).